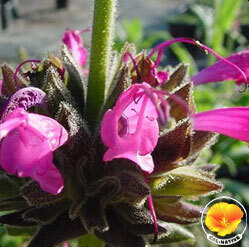 The extravagant leaves of this small clumping sage emit a perfectly sweet fragrance, which attracts hummingbirds. In the spring, the red/pink flowering spikes become a deep fuchsia. It is a great plant for dry shade.